So I thought I’d go along this year to see what it’s all about. Below are some highlights. Know now, this is long! 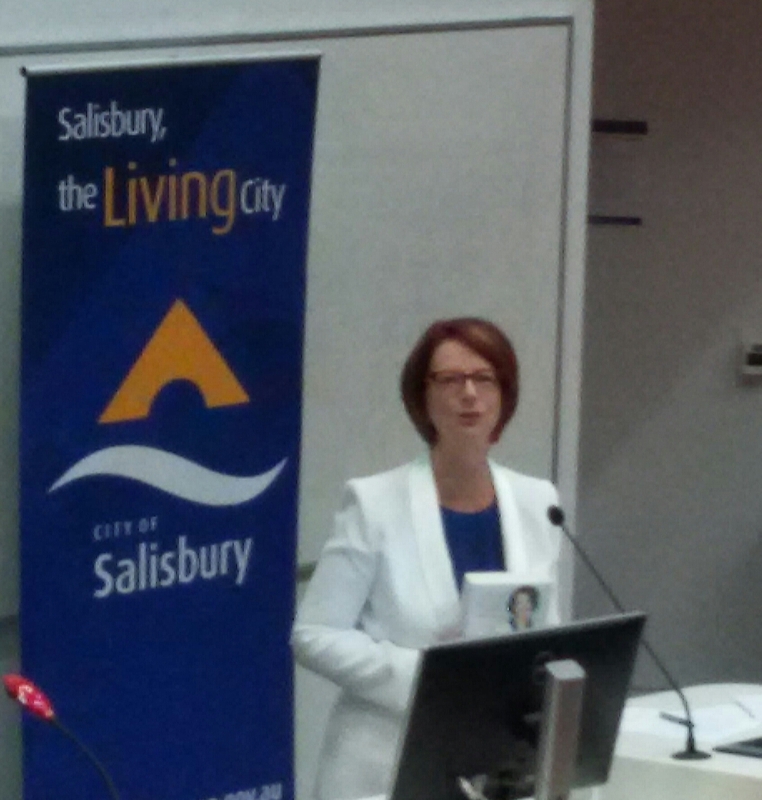 Mayor Gillian Aldridge opened the festival at the Mawson Lakes Centre, where they were thrilled to have secured former Prime Minister Julia Gillard to talk about her recently published biography My Story published by Random House. Amazingly Julia wrote this in 6 weeks, explaining that she wanted to write it as soon as possible to use the immediacy of memory. There are a few messages Julia wanted to convey in this book – a positive impression of politics for young people, how and why she did what she did, a story of resilience. Once again Julia was in top form – she really is a fantastic speaker and indeed role model for many girls aspiring to be a political figure. The launch of the anthology You’re Not Alone by young writers of True North also formed part of the evening, with participants asked onto stage to provide some context to the project, which essentially reaches out to anyone lost or lonely, or who are simply looking for a good story. It was a moving tribute. 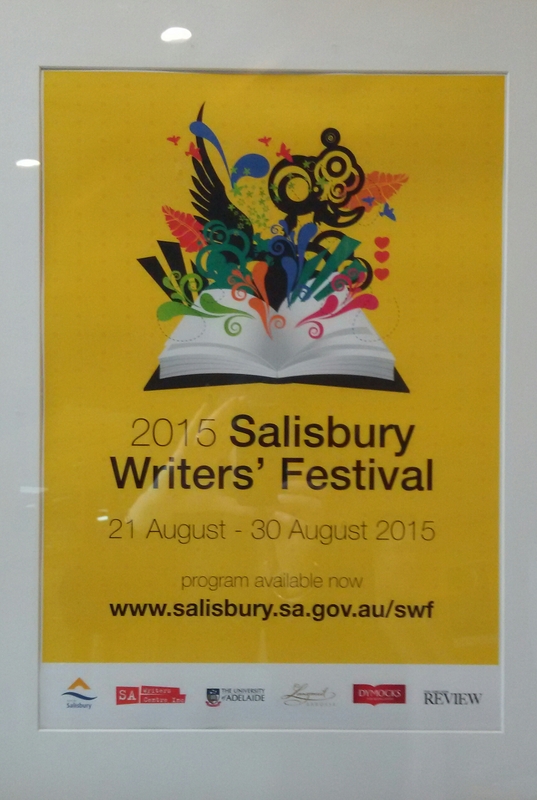 This was an all-day event of talks, debates and tips for writers across all genres, competency and experience. Now I confess I was not familiar with this actor-turned writer, but was thoroughly entertained by what he had to say and how he did it! William McInnes is one of Australia’s most popular authors, having written 8 books in 10 years, including memoir and his most recent novel, Holidays, published by Hachette Australia. William talked about the contrast between acting where you’re pretending to be someone else and writing, which is personal and all you. Above all, he said, the most important thing is that what you write means something to you, if not to anyone else, a point echoed throughout the day. This was an interesting discussion. 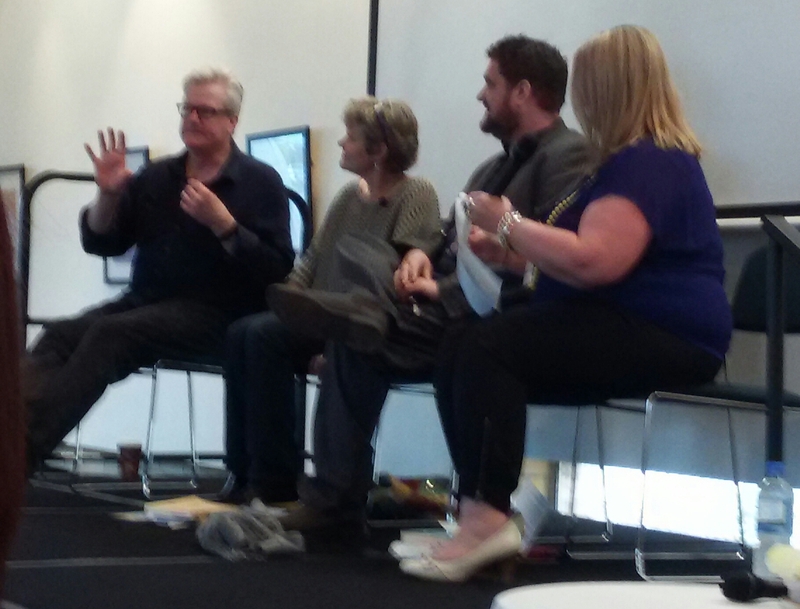 The panel comprised, from left to right, William McInnes, Jane Turner Goldsmith and David Chapple from the SA Writers Centre, who between them explored the pros and cons of writing as a cathartic process. Writing is a means of expression, a tool to help manage, understand and heal us from traumatic events and experiences. It was interesting to hear that writing for therapy is only beneficial if there’s a strong narrative and resolution, giving an example where two groups were asked to write about something that has affected them, the first as a series of thoughts and the second as narrative, i.e. having a beginning, middle and end. The second group found this to be a satisfying exercise due to the structure imposed, whereas the first group felt they were just left swimming in a pool of emotion, proving this can be a dangerous exercise if not managed properly. Writing can be subconscious, use characters or third person to reduce the anxiety associated with sharing, with writing fiction being a safe, protective environment to project the self. Even the most successful author can remain fragile about what they produce. I thought the closing remark poignant – people are designed to struggle, recover and move on; it’s what makes us human. 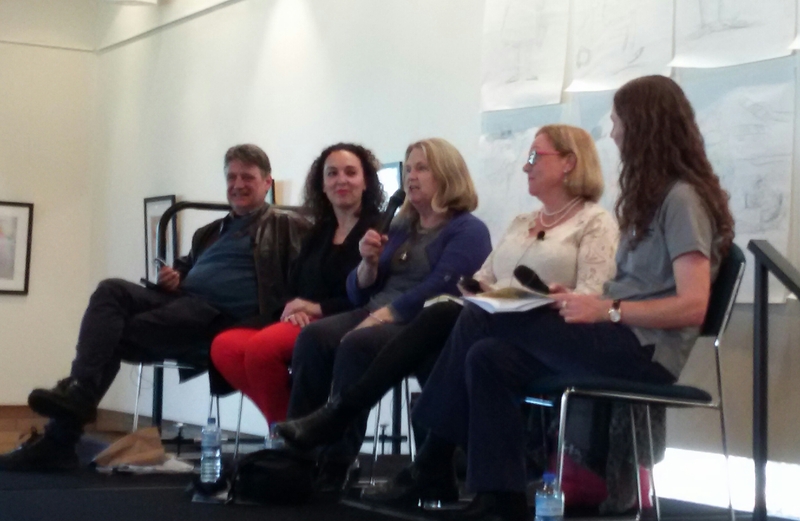 This was essentially a hints and tips session from authors with books under their belt – from left to right Kristin Weidenbach, Carla Caruso, Jared Thomas and Mandy Macky from Dymocks. They explained how the world of publishing and marketing has changed, with publishers no longer able to finance extensive book tours. The panel concluded by saying publishers look for authors who can market themselves as unfortunately, they no longer have the budget to do so. 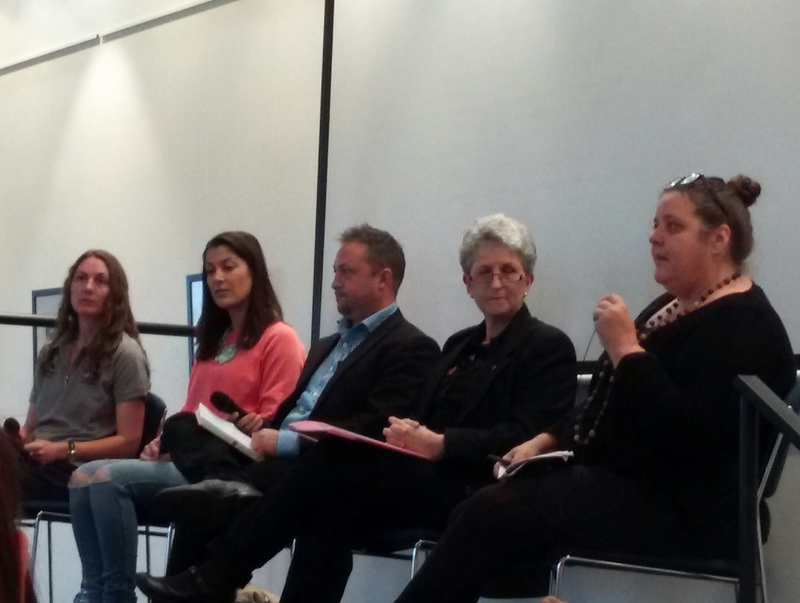 Panel of Publishers: What goes on behind closed doors? From left to right Michael Bollen of Wakefield Press, Sophie Hamley from Hachette Australia, Leonie Tyle from Tyle & Bateson Publishing and Dyan Blacklock a publishing consultant gave us an insight into a typical day, where reading new work is a small proportion and quite often done in their own time. Liaising with account manages, sending books off to the printers, exploring cover designs, organising contracts, book signings, advising on book tours and launches, attending events, these were just some of the tasks cited that fill their day where, like many of us, there are never enough hours! On this last point they strongly advised against writing what you think people want to read and a concept of ‘rear view publishing’ i.e. don’t write what’s already out there. And again another beautiful closing – a good book will always find it’s home.